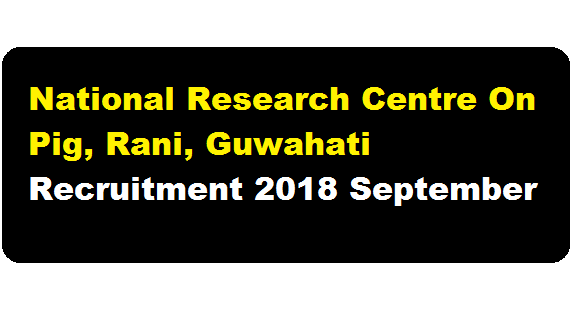 National Research Centre On Pig, Rani, Guwahati Recruitment 2018 September | Various Posts :- Applications are invited from eligible candidates for engagement of Senior Research Fellow and Young Professional posts at for National Research Centre on Pig, Rani, Guwahati. Engagement of manpower in the project is purely time bound, non-regular and also not against any sanctioned vacancy/ cadre strength/ post/ position; the service provisions for regular posts including reservations will not be applicable to these engagements. The details of the vacancy can be found below. In this section, we will discuss in details about the recruitment of different Posts under National Research Centre On Pig, Guwahati Recruitment 2018 with vacancy details, eligibility criteria, salary with other details and requirement. Age limit : 35 years for men;40 years for women. Age relaxation as per Govt. of India rules. Master’s Degree in the Life science/Pharmacology/Biotechnology/Biochemistry/Chemistry/Physics/ Veterinary Sciences/Animal Sciences/ Agricultural Sciences. Age limit : 45 years for men and women. Age relaxation as per Govt. of India rules. Interested and eligible candidates can appear walk-in interview for both the post along with their educational documents and testimonials. The details of the interview is mentioned below. Name of the Project: Technical Advisory Services for Piggery Value Chain Improvement in Assam, under the World Bank financed Assam Agribusiness and Rural Transformation Project (APART). 1/ Engagement of manpower in the project is purely temporary. 2/ The selection will be on co-terminus basis, initially for a period of 03 years or up to the availability of funds under the project or up to the performance of the candidate found satisfactory, whichever is earlier. The period of engagement may be extended for a period of another one year based on the tenure of the project/ availability of funds / performance of the candidate. 3/ The candidate must bring his/her application with latest CV along with one passport size photograph, attested copies of all certificates, testimonials, experience certificates, publications, no objection certificate from employer(if already employed). Original copies of all certificates including experience certificate, must be produced at the time of interview. 4/ No TA/DA etc. will be paid for attending the interview. 5/ The selection and service conditions will be governed as per ICAR rules/guidelines.